This post includes tweets from 6am KST, February 27th to 5:59am KST, February 28th. Why do these children not sound like they’re 26?! The ‘crazy friends network’ of JYJ’s Kim Jaejoong outside Korea is definitely confirmed. On 27th early in the morning Kim Jaejoong published a picture through his personal twitter with simple caption “It’s nice to meet you guys”, the picture taken showed Jaejoong posing with many well-known Japanese actors. Due to the blurry quality of the picture, figures spotted with Jaejoong couldn’t clearly identified, however fans quickly caught many appearances that look like group NEWS leader and actor Yamashita Tomohisa, Koike Teppei, and Shirota Yu. 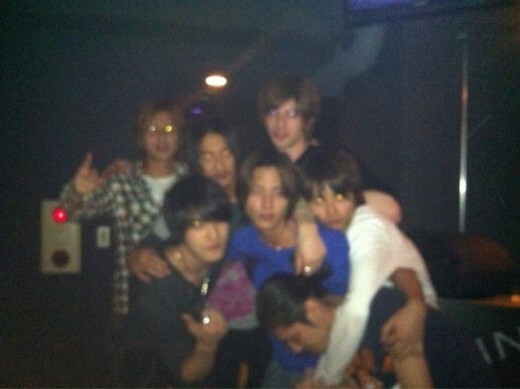 Tomohisa, Teppei, and Yu developed close friendship since high school has been a well-known fact, and Jaejoong has been said to have built a friendship with them as well during his prior long-term activities in Japan. Japanese fans are showing strong support for JYJ. The video played over and over on big screens in Japan’s major cities, including Tokyo, Sapporo, Nagoya, Osaka and Fukuoka. Starting in April, JYJ will launch a world tour in seven countries and ten cities for a duration of two months. If I do say so myself, Changmin’s high notes are really light but deep, his vocal is very nice. He should have earnestly practised this one year in order to vocalize that voice. I get stimulated by those whose performances have clearly become better. On the other hand, I do not feel anything for those who have been good performers from before, but have not changed ever since. This post includes tweets from 6am KST, February 26th to 5:59am KST, February 27th. TVXQ’s Changmin revealed that it has been 10 months since he last went on a date. He appeared with fellow member Yunho on the February 26th episode of MBC’s “Quiz to Change the World“, and elaborated that he was at an age where he’d like to go on dates. When asked the question, “How long has it been since you last went on a date?“, he replied “It’s been about 10 months“. MC Kim Gura inquired more about his ex-girlfriend and Changmin stated, “I’ve always said this before but I’m at an age where I’d like to date“. He is currently 24 in Korean age. On the other hand, Yunho stated, “I haven’t dated in 2~3 years. I found myself reacting to (certain things) in movies and dramas. When I find a girl, I want to reenact the scene in ‘A Moment To Remember’ where Jung Woo Sung tells Son Ye Jin, ‘If you drink this, we’re dating’. It looked very romantic“. On the episode, Yunho also revealed his disappointment at the female cast on “Quiz to Change the World”. He said, “I’m very disappointed at the noonims (older noonas). When we came on 2 years ago, there weren’t many idol groups so they gave us lots of love and I was very happy at the thought that I was being loved. But after that, they showed love for every idol that came on this show. Their degree of love became higher so I was sad at finding out that they love all the idols in general“. Lee Kyung Shil, Kim Ji Sun, and Park Mi Sun did their best to comfort Yunho and Changmin. After TVXQ’s dance performance they praised the two highly saying, “I felt the stage was too small for their excellent performance“. Yunho danced to Michael Jackson’s “Smooth Criminal” and was exploding with charisma. He sang and danced to the song, capturing Michael Jackson’s unique vocal style and rhythmic dance, and received praises from the cast. He did everything from the moonwalk to popping, showcasing his untouchable dance skills. The female stars went crazy after this hot performance, and even the noonims called him “Oppa”. MC Park Mi Sun received warnings from Kim Gura for liking the performance too much giving him a standing ovation. On February 23rd, representatives of MBC’s “Knee-Drop Guru” revealed that TVXQ completed their recording for the show in strict secrecy. Aside from program representatives, the recording was completely closed off and sealed in order to prevent content leakage. Although their appearance was previously dismissed as rumors, TVXQ completed their appearance with only the necessary staff members present. Because Yunho already has a close friendship with MC Kang Ho Dong, the recording was said to have taken in a comfortable atmosphere. Topics discussed ranged from the crises their group faced for the past two years, the leave of the other members, as well as the appearance of discord between them and the other members while preparing for their comeback.